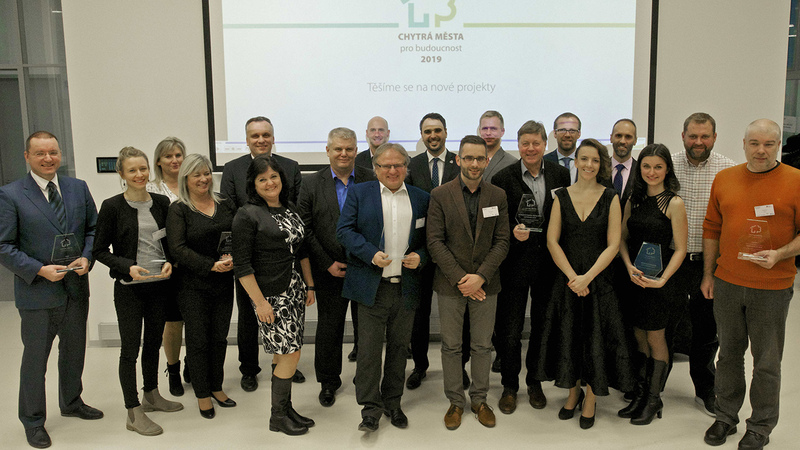 OMS wins first place in the CHYTRÁ MĚSTA BUDOUCNOSTI 2018 competition! 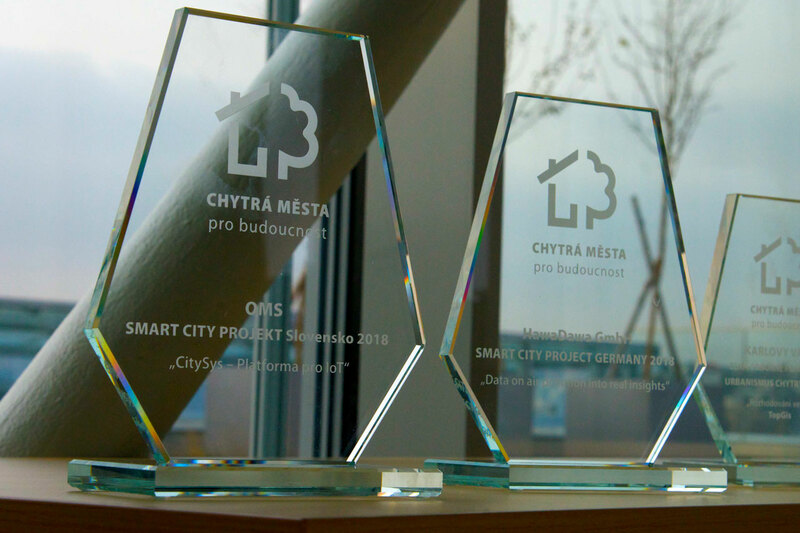 The CitySys platform from OMS, a.s won the International prize as selected by an expert jury in the category: SMART CITY PROJECT Slovakia 2018! We think ecologically! Our actions make your life better. 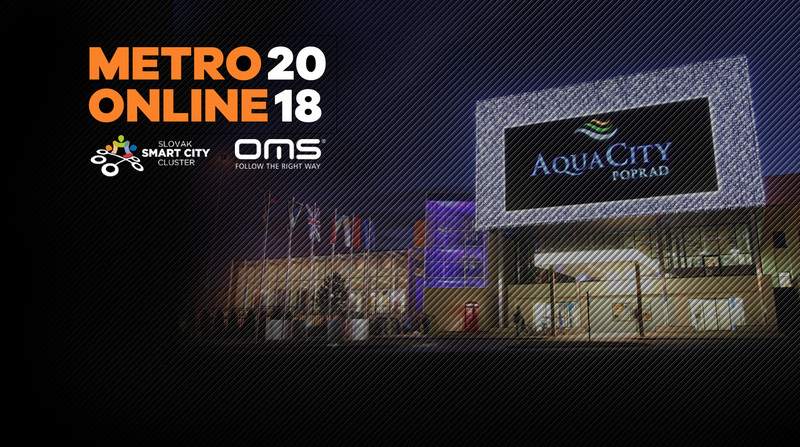 METRO ON LINE 2018 OMS will attend from 11.6.until 12.6.2018 a significant event called METRO ON LINE 2018, which takes place under the auspices of the Chairman of the Prešov Self-Governing Region. Shorter is better OMS within our ordering structure comes important changes and transformation in the last few months. We have listened to our customer’s feedback. To increase customer satisfaction and give more effective communication within our portfolio as a priority and that’s why we decided to make a big and exciting changes! The President of Slovak Republic Andrej Kiska visited OMS, a.s. The company OMS, which is one of the main employers at Zahorie, was honoured by a visit of the President of Slovak Republic Andrej Kiska. The President visited us during one of his regular business trips to around Slovak regions. OMS goes the right way The company OMS took part at one of the most significant European exhibitions in lighting, Light + Building 2018, for the 7th time. The company introduced its objectives for the upcoming years with regard to the provision of new solutions and digitisation. Our main goal is to provide added value in order to improve the quality of life and increase the overall comfort. Thank you for visiting our stand The Light + Building 2018 is successfully finished and OMS has confirmed its role as a global professional provider of smart solutions in Smart City, Smart Industry and in the other areas of digital technology. WE LIT THE ZOOT The fashionable e-shop ZOOT.cz is originated in 2010 in Prague. From the very beginning its vision is to "do it a little differently". Approved Place of Manufacture OMS is proud to announce that we have been awarded “Approved Place of Manufacture Certificate”. Changing of the lighting system at The National Council of the Slovak Republic. At the end of August this year, the session hall of the National Council of the Slovak Republic passed a significant change in the lighting system. Light and Building 2014 was a huge success! „Two short years ago, the industry was focused on the lumen/watt race. In 2014, the focus has shifted to the quality of light in combination with innovative light management systems. OMS to Showcase the Latest Lighting Trends at Light+Building 2014 DOJČ, Slovakia — March 7th, 2014 - OMS Lighting (OMS), Europe’s fastest growing lighting solutions provider announced it will showcase the intersection of global trends with its industry leading lighting innovations at Light+Building 2014, the world’s leading trade fair for architecture and technology, from March 30 to April 4 in Hall 4.2, Stand F10 at Messe Frankfurt in Germany. OMS to Present the Psychology of Lighting for Retail Success at EuroShop 2014 DOJČ, Slovakia — January 16, 2014 — OMS Lighting, Europe’s leading lighting manufacturer and lighting solutions provider, today announced it will showcase its industry leading lighting solutions for the retail sector as an exhibitor at EuroShop 2014, “The World’s Leading Retail Trade Fair” from February 16-20 in Düsseldorf, Germany. OMS solidifies its commitment to the DALI standard for digital lighting Today announced its status as the only lighting manufacturer in Central and Eastern Europe capable of performing DALI compatibility testing on its products, in-house. DALI (Digital Addressable Lighting Interface) is the widely adopted industry standard for digital lighting solutions. OMS’ recent purchase of a DALI testing system from Lichtvision in Germany will not only guarantee all OMS products are DALI compliant but streamline product development, ultimately benefiting OMS customers. Energy Saving Division – announcement In 2013 OMS established an in-house Energy Saving Division as an extension of our focus on providing customers with the highest level of service and the most effective lighting solutions. Lighting control and monitoring can be now implemented from anywhere on the planet DOJČ, 21th January 2014 – Intelligent Lighting Management Systems – the right amount of light, at the right time and in the right place. LIACS software - new tool to help increase energy savings from lighting The LIACS tool is a calculation software designed to show and quantify the impact of the lighting system upon the air condition system`s cooling load. OMS Introduced the Current Situation and Prospects of LED Technologies at the Conference „Svetlo 2013“ (Light 2013) The 20th year of the conference was held on 23rd – 25th October at the hotel Permon at Podbanské in the High Tatras. Presentation of the latest lighting trends in Montenegro OMS presented the latest technology in lighting following newest trends, which is offered to the Montenegrin market. OMS at the Swiss technology fair ineltec 2013 Together with its partner Swiss company Küttel exhibited on 10th to 13th September at the technology fair for building and infrastructure. OMS Retail Lighting at the Shopping Center Forum 2013 On 18th to 19th September the Shopping Center Forum 2013 (its autumn edition) takes place in Warsaw. OMS Design competition 2013 OMS Lighting in collaboration with Slovak design centre proudly presents the 2013 OMS Design Competition. OMS is expanding to India OMS has chosen a strong local partner Eon Electric to successfully enter the Indian lighting market. OMS Central Power Source OMS’ Central Power Source (CPS) delivers an innovative solution to centralized power supplies for lighting fixtures. New Catalogues and Brochures If you don't have the 2012 catalogues and brochures, please use the links below to discover OMS’ exciting lighting trends and technologies. New Catalogues 2013 The highly anticipated ELITE, ADVANCED and UNOLUX 2013 catalogues have arrived. OMS wins first place in the CHYTRÁ MĚSTA BUDOUCNOSTI 2018 competition! The CitySys platform from OMS, a.s won the International prize as selected by an expert jury in the category: SMART CITY PROJECT Slovakia 2018! As the name suggests, the forum was dedicated to technologies that are used in Smart Cities. Over 130 respected experts from Germany, the Czech Republic, and Slovakia attended the meeting. A well-balanced agenda of specialised speeches on interesting topics was crowned by the Chytrá města budoucnosti 2018 awards. The CitySys platform clearly received the best feedback from the jury in the category.The platform captured their interest with its openness and its capability to integrate several applications necessary to efficiently manage towns or cities, into a single system. CitySys enables you to monitor, evaluate, manage, and analyse data, increase the efficiency of town and city administration, lower overall operation costs and bring about better conditions for residents’ lives and business. The jury appreciated this technological and business openness, meaning the platform has the capability to be expanded with other modules and applications over time. It also permits integration with other systems from different vendors (parking, waste management, and others), which allows the platform to monitor important parameters of a particular city/town area within a single user interface. OMS thereby confirmed its leading position amongst Slovak and Czech Smart technology providers. Our actions make your life better. OMS will attend from 11.6.until 12.6.2018 a significant event called METRO ON LINE 2018, which takes place under the auspices of the Chairman of the Prešov Self-Governing Region. It will present the latest trends and innovations in SmartCities, IT Security and Blockchain technology for the construction and operation of metropolitan optical, coaxial and wireless networks of a wide range of telecommunication services and retransmission services (ISPs) in Central Europe, representatives of Slovak and Czech municipalities with attendances of Start-Up scenes in SmartCities and Telco. At the conference, participants will get acquainted with the current offer of high-tech products for the passive and active part of the network, telecommunication facilities, technology for the construction and operation of networks, IoT, modern Smart services for residential customers and customers from the business sector. The conference will be attended by prominent speakers from various companies, including our Executive Director, Mr. Radovan Slíž. On June 12, 2018 at 13:30 he will present the benefits of SmartCity implementation through the exchange of public lighting through his presentation "Light as the right way to SmartCity or SmartCity is not a cost item". The main benefits of replacing public lighting is the uniform layout of light fixtures and their easy replacement by IoT Ready LED luminaires, which will save costs to city for further development. During the conference you will also have the opportunity to visit the presentation stand and discuss with our experts who will be happy to answer your questions. We are looking forward to you. OMS within our ordering structure comes important changes and transformation in the last few months. We have listened to our customer’s feedback. To increase customer satisfaction and give more effective communication within our portfolio as a priority and that’s why we decided to make a big and exciting changes! The President of Slovak Republic Andrej Kiska visited OMS, a.s. The company OMS, which is one of the main employers at Zahorie, was honoured by a visit of the President of Slovak Republic Andrej Kiska. The President visited us during one of his regular business trips to around Slovak regions. Present during this official visit was members of President’s team, Mr. Roman Karpelan (a media consultant), Mr. Michal Luciak (a consultant of home politics), Mrs. Vladimira Ledecka (the head of regional politics department), and Mrs. Natalia Smolenova (department of regional politics) and Mrs. Michelle Marie Soukup (department of home politics). The President of Slovak Republic was welcomed by Radovan Slíž, CEO of OMS. The official discussion was joined by senior representatives of OMS, Mr. Vladimir Levarsky (a shareholder of OMS), Mr. Pavel Mazak (Finance director) and Mr. Erik Gašparík (Sales director). OMS has transformed from a creator and distributor of luminaires to a high technological oriented company. The company offers not only general luminaires, but also Smart solutions, which are mentioned presently more and more. The President was interested in our successful export marketing but also his interest was focused on our lighting innovations bringing professional digital technologies on IoT basis. Mr. Radovan Slíž introduced the company of OMS, its product portfolio, an offer of project solutions and also the company’s innovations in the Smart technology, especially Smart City (CitySys), Smart Shop (ShopSys) and Smart Industry (WorkSys) solutions built on IoT platform. After the official discussion the president was presented with a luminaire HEXA, which was designed and created in our company and winner of the coveted National Price of Design. Our R&D specialists gave an overview of the functionality of our platforms in CitySys, WorkSys and ShopSys components. They also exhibited to the President our new product ranges such as Smart Pole, Dynamic Shop Window, Smart Mirror and we are extremely proud, that the President took an opportunity to try out for himself the benefits and opportunities that OMS offers to its customers. Our partners and customers will have opportunity to experience them all at our new showroom of IoT solutions that is set to become the biggest showroom in the Europe. The visit of LED manufacture and the introduction of our unique Smart Public Pole raised many questions and we believe our answers gave a better overview of OMS Smart solutions to the President and his team. During the company tour, Mr. President also took time to speak with our employees working within individual departments, we really appreciated this due to his tight schedule. President Kiska in his interview commended the functioning of our company and mentioned he was pleasantly surprised by the many smiling employees, which confirmed that OMS, a.s. is going the right way. We give our heart-felt thanks Mr. President for honouring us with your visit. The company OMS took part at one of the most significant European exhibitions in lighting, Light + Building 2018, for the 7th time. The company introduced its objectives for the upcoming years with regard to the provision of new solutions and digitisation. Our main goal is to provide added value in order to improve the quality of life and increase the overall comfort. The Light + Building 2018 is successfully finished and OMS has confirmed its role as a global professional provider of smart solutions in Smart City, Smart Industry and in the other areas of digital technology. The company provides high quality luminaires that can be expanded with additional sensor parts, making them a source and data generating location with available connectivity whenever and wherever customer needs. The state-of-the-art quality of luminaires and of the whole lighting system is the ideal infrastructure for such data acquisition in every application, and OMS support for collecting, storing, visualising and processing of data into final information is a special opportunity to all our customers to become the part of the industry's transformation. 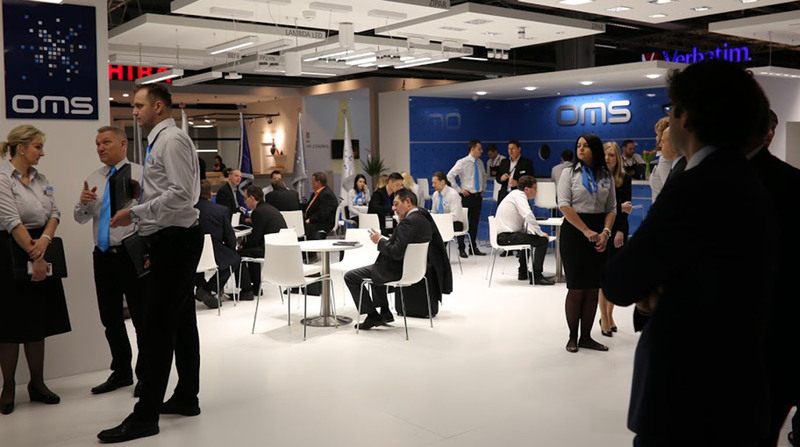 OMS was the only one company at Light + Building fair, which provided a comprehensive view of this transformation and to reassured the general public, that it is ready to fully support existing and new customers to bring additional information value. OMS as a reliable partner offers the implementation of this concept also in their regions as well as in the whole area of their activities. All materials you could see at L+B are available now. For more information, do not hesitate to contact us. The fashionable e-shop ZOOT.cz is originated in 2010 in Prague. From the very beginning its vision is to "do it a little differently". Customers can conveniently make orders from anywhere, they can send them either home / work or to one of “Expense of Joy ". They can try their ordered products first, then decide what they want and what they would pay. They also offer 90 days to return goods - free of charge. The transport to the customer is always free of charge, regardless of the order value, too. Beyond that, ZOOT is one of the fastest growing innovative European companies (according to Inc. Magazine). For the company OMS Lighting is innovation one of the main corporate visions, and our specialty in the market - Smart Mirror - has interested ZOOT team due to its novelty. We are proud of the fact that in such important cases as is the modernisation of one of the ZOOT,,Expense of Joy“, they have turned to us. The choice of different lighting in the changing room as well as the connection between the mirror and the ceiling lighting was one of the main prerequisites for this interesting collaboration. In addition, Smart Mirror products have been tailored to ZOOT requirements and can therefore be attributed to customized logos. ZOOT will open by the end of 2017 a total of 10 new Expense of Joys in the Czech Republic and Slovakia. Each one has its design specifics and we have already lit most of them. We believe that even thanks to OMS products, ZOOT will continue to be one of the successful and fastest growing brands in the market. OMS is proud to announce that we have been awarded “Approved Place of Manufacture Certificate”. Changing of the lighting system at The National Council of the Slovak Republic. 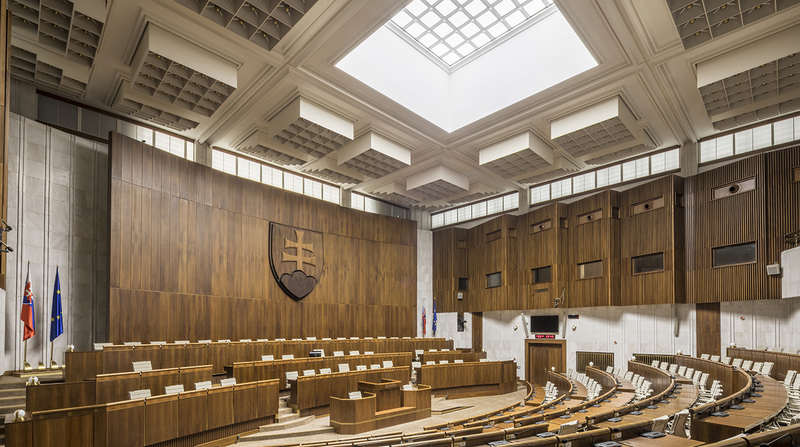 At the end of August this year, the session hall of the National Council of the Slovak Republic passed a significant change in the lighting system. Recently, we supplied Sinergyca showroom named Lumen Power with sample luminaires from our portfolio. Sinergyca is a company that focuses on increasing energy efficiency and productivity by providing tailor-made solutions, monitoring, and energy services for a varied range of commercial, industrial, and residential applications. In their showroom, they present a selection of, as they write on their website, “the most advanced indoor and outdoor LED lighting products, taking into account only guaranteed and certified products“. Versions vary in lumen output, wattage, lumen output, optics, light source, CCT, CRI, surface finish, type of mounting, and many other parameters. It only proves that OMS products are highly flexible and meet the expectations of even the most demanding customers. You can see each of the thirteen luminaires in the reference section. When you first look at our brand new urban luminaire IMMA, the first thing you notice is its looks. It’s different. The supremely simple, softly curving design with one single, large lens and a smooth, finless finish is nothing like other luminaires on the market. But don’t be fooled into thinking this is the result of compromise. In fact, it is the appealing outcome of our product developers’ journey in a new direction in urban luminaire design that makes use of the latest LED innovations and the very best optical techniques and technologies to create something truly unique. Many modern urban luminaires are, well, rather ugly. IMMA has a modern, clean style that still holds onto some of the comforting softness of older, traditional luminaires. This means IMMA makes perfect aesthetic sense in any setting, especially in urban and residential areas where people wish to be surrounded by pleasing and familiar forms. IMMA, therefore, is an architect’s best friend. But what about being the best friend of the lighting designer and urban administrator. Well, IMMA doesn’t disappoint here too. The clever optics come in a range of light distributions allowing lighting designers to use the same product to meet the needs of installations with complex and varied needs. What’s more, IMMA’s mono-lens optical system benefits from excellent light transmission and lens clarity, and no birefringence. It is also UV-resistant, so does not yellow and become less effective over time. And from a mechanical point of view, the lenses are especially tough as they are resistant to micro-cracks. This is all in addition to the use of very robust materials and components for the rest of the luminaire, including everything from long-lasting electronics to a superior surface finish. All these features together create a luminaire that offers exceptional, robust, and reliable lighting and technical performance that will last, and a covetable efficacy of up to 143 lm/W. As if this is not enough to make urban administrators swoon, IMMA is suitable for inclusion in installations using any modern lighting control technology, from simple photocell-based regulation to futuristic smart city systems. The conclusion? IMMA is a cost-conscious, high-performance, robust, and highly effective luminaire that offers exceptional technical and optical longevity and easy controllability. And it looks great! What’s not to love? For more detailed information about the technologies used in IMMA, take a look at our upcoming blog posts. 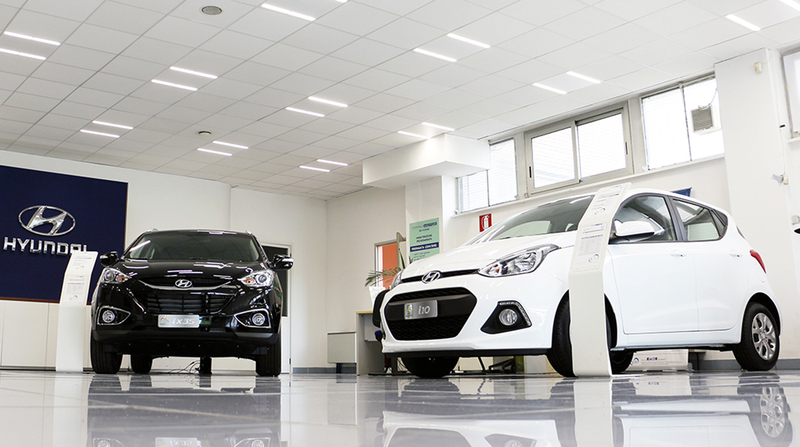 In collaboration with our Italian lighting partner ALTER LINE, we have realised new future-friendly lighting renovations in two top-brand car showrooms in Turin, Italy. Both showrooms are owned by Autoingros Torino, a member of the Intergea Group, one of the biggest car retailers in Italy. Turin is a city packed with historical and cultural heritage and serves as a business centre for the north of Italy. As such, it is only fitting that stores and showrooms there be equipped with the very best lighting solutions. The Autoingros Store sells top Italian brands Fiat, Alfa Romeo and Lancia. The lighting solution makes use of cost- and environmentally-conscious NIHAL ECO 25 W, 1900 lm, and 37 W, 2900 lm, both with a stimulating CCT of 4000 K.
The second store to be renovated was Torino Motor Hyundai. 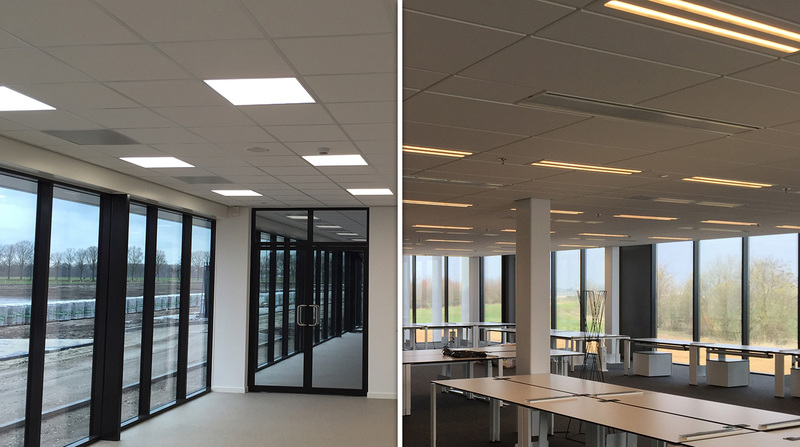 Here the new solution uses OMS favourite FREYN II PV-1 36 W, 4250 lm with CCT 4000 K.
The solutions not only look the part thanks to the stylish, minimalist design, they also provide excellent light quality that supports visual comfort, performance and positive customer perception. The owners of Autoingros are so pleased with the new lighting solutions that they have decided to roll out similar lighting renovations across their other six showrooms. GACRUX utilises the latest LED technology and optimised optics to provide effective, efficient illumination that meets the stringent needs of office lighting while improving user-comfort and saving energy and the environment. In a groundbreaking project as part of Baku White City, GACRUX has been used to complete a high-tech and high-savings lighting installation in one of the key business premises of the city. Baku White City is a newly developed sustainable city in Azerbaijan. Adjoining the current Baka city area, it aims to develop in a socially, economically and environmentally sustainable manner by making efficient use of infrastructure, energy and other resources. GACRUX high performance certainly fits the agenda of this remarkable sustainable development. This project was developed by SLE. OMS has just lit up the brand new Bory Mall, providing high-tech lighting that supports the unique architectural and aesthetic experience while also miniminsing energy consumption. For the interior, lighting designers chose to use downlights PRETTUS, PRO 202, 211 and 212, and ceiling surfaced CLASSIC. For the interior parking area the reliable and timeless Tornado was used, and outside you can find the new energy efficient LED street luminaire SEMAI. The mall, designed by world-famous Italian architect Massimiliana Fuksas, is an architecturally stunning retail, leisure and entertainment paradise. With 54,000 m2 of retail space dedicated to big brand fashion, children’s, sports, electronics, book and food stores in addition to a 12 screen CINEMAX (and soon to be IMAX), 4200 m2 Buppa Children’s World, remarkable covered central garden courtyard and more than 2400 parking spaces, shoppers can find all they could possible need under one roof. By delivering a perfect blend of shopping, service and leisure facilities and services, and thanks to its size and location near the heart of Bratislava, Bory Mall is set to be a focal retail point across west Slovakia. On 12 November, OMS attended the iKariéra work fair ‘Days of Opportunity’. Held twice per year, and with a history spanning more than two decades, the fair is organised to bring together up-and-coming technical talent with the most prestigious companies in their fields from Slovakia, Austria, the Czech Republic and Hungary. The fair is aimed at the students from the faculties of Electrical Engineering and Informatics (FEI) and Informatics and Information Technologies (FIIT) at the Slovak Technical University of Bratislava (STUBA) as well as those from the faculties of Mathematics, Physics and Informatics (FMFI) and Natural Sciences (PriF) at Comenius University (UK). With an average attendance of more than 2000 technical students, the fair is a productive platform from which companies can present themselves to future employees, showing students what options there are out there and trying to gain the attention of those who can make their mark in the technical world. OMS attendance was successful and prompted much interest in the future graduates who will be influential the development of the lighting world. Modern styling combined with performance, economy and adaptability; there is nothing more you could need from a downlight than that provided by NOVIEL. With an excellent efficacy of up to 102 lm/W (EEC A++) and fantastic lux to price ratio, you can rest assured that replacing your old CFL or LED lighting installations needn’t break the bank. And in addition to this, you can further increase your saving potential as well as comfort by opting for the DALI LED driver option as opposed to the standardly supplied FIX one, allowing you to precisely manage your lighting according to need using automated control. Providing lumen outputs ranging from 1300 lm to 3450 lm and CCTs of 3000 K or 4000 K across three sizes, S, M and L, there is an ideal option for every interior application and can replace luminaires with up to 2 x 42 W CFL lamps. Using a simple yet effective polished reflector and diffuser optical system, you are assured of highly comfortable illumination. Furthermore, with a full metal (sheet steel and aluminium) construction, a lifetime of 50,000 hours L80 and operational stability at ambient temperatures up to + 35 ºC, you can just fit and forget without the need to concern yourself with maintenance or replacement for many years to come. And safety comes as standard, with 3H emergency kits for all variants and optional protective covers to provide higher IP 40 or 44 ratings, NOVIEL can take whatever life throws at it. NOVIEL also comes with the added advantage of rapid supply to demand, thanks to the use of a simple and unified design throughout the whole family. In this way we can assure customers of the best prices and the greatest flexibility no matter the size of the order. And if that isn’t enough, we are also happy to customise NOVIEL to your specific needs within unbeatable timescales. This is not just any downlight. In fact, with 56 different variants, PRETTUS dominates the downlight world in terms of its ability to fit need. This discreetly styled gem has one of the best lux per Euro ratios in its class and an efficacy of up to 104 lm/W (EEC A++), making it possible to choose the very best on even the tightest budget. Choose from lumen outputs ranging between 1150 lm and 3300 lm, CCTs of 3000 K or 4000 K and various combinations of reflector and diffuser in sizes S, M or L to tailor PRETTUS to your specific application, with the option of further product customisation available on request. Supplied with a FIX, or DALI compatible LED drivers, your lighting installation can be managed according to need and desire using lighting scenes, timers and schedules to bring the highest levels of autonomy, energy saving and user-comfort. With a full metal (sheet steel and aluminium) housing, you can rely on the construction of PRETTUS to live up to its great lifetime of 55,000 hours L80 in S and M versions and 50,000 L80 in L versions. What’s more, with 3H emergency kits available in all variants, high IP protection covers with IP 40 or 54, and operational stability at ambient temperatures of -25 °C to +35 °C in S versions and -20 °C to +35 °C in M and L versions, PRETTUS can also face more demanding areas of use with ease so you can rest assured it won’t let you down. And if this isn’t enough to convince you of PRETTUS’ superiority, bear in mind that thanks to the use of a simple and unified design throughout the whole family, we can assure customers of the best prices and ultimate flexibility as well as being able to react quickly to every order, even those for customised versions. FREYN II boasts one of the best lux per Euro ratios on the market and a remarkable efficacy of up to 118 lm/W (EEC A++), meaning that price need no longer be an obstacle to using the best lighting technology in every office. And you needn’t worry about the light quality that goes with these amazing parameters, as FREYN II houses a highly effective diffuser optical systems that offers a UGR < 19 in CCTs of 3000 K and 4000 K to ensure visual comfort all day long no matter how arduous the task at hand. Supplied with FIX or DALI and 1–10 V compatible LED drivers, the provided illumination can be regulated exactly according to each individual need, further enhancing the autonomy and energy saving of your installation and therefore user-comfort and respect for the environment. Available in a wide range of sizes and recessed mounting types to suit any ceiling construction, FREYN II can replace luminaires with up to 4 x 24 W linear fluorescent lamps or older LED systems to bring a new level of lighting performance and efficiency. Furthermore, with a new and even better lifetime performance of 50,000 L80 with operational stability at ambient temperatures of -20 °C to +35 °C, there is nothing to stop your new FREYN II installation providing perfect illumination for many years to come without maintenance or stress. Plus, to ensure safety in every space, all FREYN II variants come with 3H emergency kits. So, just fit, forget and flourish. How it that FREYN II is this good? Thanks to its modern white RAL 9003 aesthetic, simple solid sheet steel construction and a unified design across the whole family, we can pass to customers great price and flexibility benefits in addition to being able to react quickly to orders both large and small as well as requests for product customisation. Almost two decades ago, OMS entered the lighting market as a small luminaire manufacturer. It was never our intention to be a merely average company. Through the years, our portfolio expanded, which in turn allowed us to focus more on the development of lighting technologies and not only their manufacture. As we delved into the intricacies of light and implemented our findings into innovative products, we grew to become an instrumental player on the global lighting scene. In-house development advanced, and we came to realise that our R&D department had at their disposal a huge untapped potential, a potential that could truly move the lighting world forward. In response to this, we expanded our R&D operations and founded iLumTech, which has taken over our R&D position and now continues in our footsteps as a key influencer of lighting control and technological development. Housed within our state-of-the-art Lighting Innovation Centre, iLumTech is an international team of academic, design and engineering specialists. With access to the most refined, precise and powerful development technologies, they can offer both lighting and non-lighting products and services of unrivalled quality. This capability is further strengthened by collaboration with some of the best minds at several leading universities, institutions and companies. OMS now wishes to offer the technologies, expertise and skill found within iLumTech to you, our customers. Take a look through the pages of the iLumTech Book of Services, and see how our expansion enables us to help you reach your business goal. Light and Building 2014 was a huge success! „Two short years ago, the industry was focused on the lumen/watt race. In 2014, the focus has shifted to the quality of light in combination with innovative light management systems. We have identified four major trends in lighting which include: energy saving, light and safety, light and psychology and human centric lighting. Our booth concept introduced these trends with real applications while highlighting the latest technologies from electronic, optic, thermal design featuring futuristic concepts of luminaires. The customers have spoken and it should come as no surprise that LB2014 was the most successful exhibition in the history of OMS,“ said Manfred Raffler, COO, OMS. DOJČ, Slovakia — March 7th, 2014 - OMS Lighting (OMS), Europe’s fastest growing lighting solutions provider announced it will showcase the intersection of global trends with its industry leading lighting innovations at Light+Building 2014, the world’s leading trade fair for architecture and technology, from March 30 to April 4 in Hall 4.2, Stand F10 at Messe Frankfurt in Germany. n its fifth year as an exhibitor, OMS invites trendsetting lighting designers seeking comprehensive customer support for a 360° experience in the effect of the Right Light. Attendees will uncover trends that move the world of lighting through interactive displays and also, gain unique insight into OMS’ lighting expertise by meeting the R&D experts and viewing demonstrations of their cutting-edge technological innovations. “OMS’ presence at Light+Building 2014 will reflect how we have grown to become an important European influencer in the global lighting space— a company that is shaping the future of lighting,” said Vladimir Levarsky, CEO, OMS. “Our goal is to show how the innovative solutions we have developed in recent years, combined with our worldwide network of suppliers and partners, have positioned us as a top player ready to tackle large-scale global projects." The OMS exhibit will be divided into two sections: Global Trends and OMS Lighting Innovations. The first section will be dedicated to the following global trends: Light and Psychology, Human Centric Lighting, Light and Safety and Energy Saving. Trends will be illustrated through real-world examples that feature lighting solutions demonstrated in different environments. 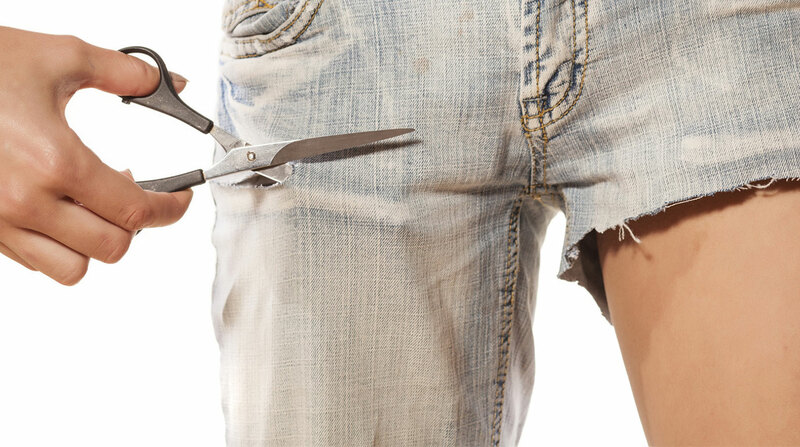 Light and Psychology: Modern purchase behavior is driven by desire rather than need. As store differentiation based on merchandise, price, quality and location becomes more challenging, retailers must look at new ways to connect with their customers and build loyalty. The use of the right light can have a direct influence on every area of retail success. Understand the relationship between shop window, accent and dynamic lighting and how to use brightness, colour temperature and colour to boost sales. Human Centric Lighting: Human centric lighting may well be the next great step forward in the evolution of lighting. Humans have a fundamental need for the physiological and psychological regulation that daylight provides. Learn how modern technologies can bring the benefits of daylight into our interior spaces by means of changeable brightness levels and colour temperatures. Light and Safety: White light is imperative for public lighting, as it is perceived as brighter and provides superior colour rendition compared to the commonly used yellow light. It greatly improves visual acuity and therefore increases safety for those using our roads and public spaces. 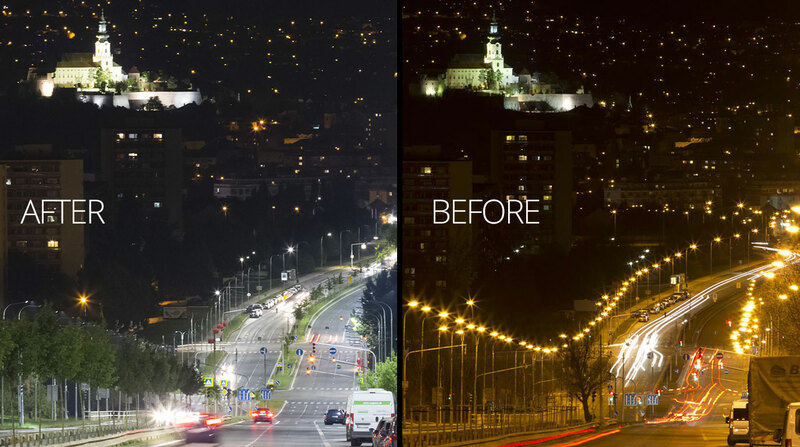 See the actual difference between effective and ineffective street lighting. Energy Saving: Lighting is responsible for forty percent of a building’s electricity consumption, consuming scarce energy resources and contributing greatly to CO2 emissions. A simple switch to LED lighting can provide savings of up to sixty percent, which may be increased to almost eighty percent when combined with the use of a Lighting Management System. Find out how lighting is one of the most effective energy efficiency measures and provides the fastest return on investment. The second section of the OMS exhibit; OMS Lighting Innovations, will offer an exclusive look into the inner workings of OMS’ R&D department. Experts from Thermal Design, Electronic Design, Optic Design and Product Design will demonstrate their ground-breaking work in energy harvesting, gesture control, nano structures and conceptual designs, to name a few. Visitors will also learn about OMS’ patented system of rating lighting products and solutions, Lighting Quality Standard (LQS), which ensures the right light is used for each application. LQS combines 20 objective rating criteria with six key elements (Ergonomics, Emotion, Ecology, Efficiency, Esprit and Exceptionality) to judge a lighting device or solution. In addition to its exhibit, OMS invites visitors aboard its ELT truck, which will be parked around the corner from Hall 4 at Hall F04.0, stand A05. OMS’ innovation was recently recognised by the ‘Design Plus powered by Light+Building’ competition. Its DUELIS luminaire was one of 36 products to earn the prestigious Design Plus Award, a seal of quality for products demonstrating future viability, innovative design and energy-efficient technology. DUELIS, selected by a highly qualified jury of experts from 238 entries, will be displayed in a special exhibition for competition winners during Light+Building 2014 in Hall 1.1, stand E51. With DUELIS luminaire, OMS also participates at ‘Architecture and Technology Prize for Innovation’ that reward products and conceptual solutions that impress both in terms of their design quality and their technicality. DUELIS will be one of the projects presented as part of a special display during Light+Building 2014 in Hall 3.1, stand D40. OMS produces lighting solutions for commercial, residential and architectural applications, advancing the use of LED technology and sophisticated thermal management. Its comprehensive product portfolio combined with customer-driven support services ranging from lighting design and installation to maintenance and inspection contribute to OMS’ status as a global leader in lighting innovation. 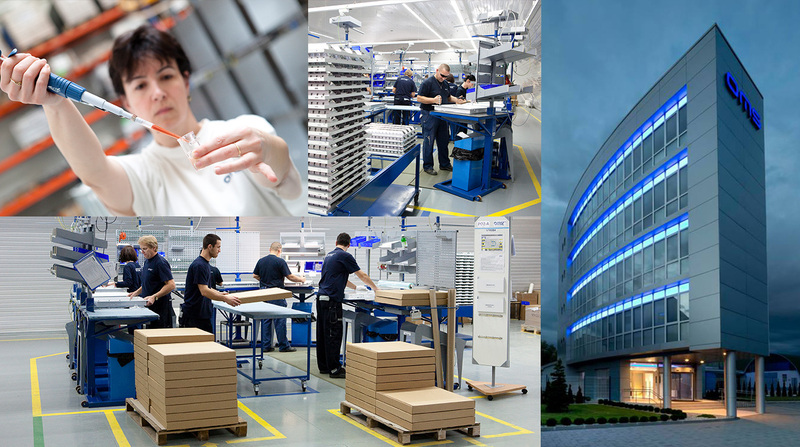 OMS has risen to become the fastest growing lighting company in Europe with more than 1000 employees. Its research and development centre, known as the Lighting Innovation Centre, comprises 120 experts that play an integral role in advancing the future of LED in Europe. DOJČ, Slovakia — January 16, 2014 — OMS Lighting, Europe’s leading lighting manufacturer and lighting solutions provider, today announced it will showcase its industry leading lighting solutions for the retail sector as an exhibitor at EuroShop 2014, “The World’s Leading Retail Trade Fair” from February 16-20 in Düsseldorf, Germany. With the theme, “Lighting Psychology for Retail Success”, OMS invites the world’s largest retail brands, renowned lighting designers and architects to experience the powerful impact the Right Light has on retail success. OMS representatives will showcase retail lighting solutions for applications including accent, dynamic and shelf-level lighting, to name a few, at Stand G73 in Hall 11. OMS has designed and implemented game-changing lighting solutions for global retail brands including IKEA-MEGA (Russia), Apple (Slovakia), Champion(Italy), Fnac (France), Louis Pion (Belgium), Steffl and Auer (Austria) as well as Topshop National (Australia) and many others. The company’s wide range of custom retail lighting solutions and award-winning LQS methodology make OMS a highly sought-after partner for retailers worldwide. “The psychology of lighting in a retail setting cannot be understated as it has a proven effect on everything from customer behaviour to their emotional engagement and perception,” said Manfred Raffler, COO, OMS. The company will present the latest in retail lighting trends, with a focus on lighting psychology in retail. Discover how OMS products ZIPAR TRACK, AVIOR TRACK and COMET MOTION can provide perfect accent lighting. Learn how AVIOR MOTION,ZIPAR MOTION RECESSED and AVIOR SURFACED can be used to create dynamic lighting and draw attention to shop windows. Explore how TARF ADJUSTABLE and LED strips can define shelf displays. With demand for OMS’ industry expertise growing, the company has assembled a new team of project managers dedicated to providing the best service for prospective customers in the retail sector. The team leverages OMS’ groundbreaking, patented system of rating lighting products and solutions, Lighting Quality Standard (LQS) to ensure the right light is used for each client application. LQS combines 20 objective rating criteria with six key elements (Ergonomics, Emotion, Ecology, Efficiency, Esprit and Exceptionality) to judge a lighting device or solution. Over the past 17 years, the biggest companies in the world have trusted OMS to provide not only the highest quality lighting products and solutions but overall industry education. Its European Lighting Tour (ELT) roadshow is just one example of its unique approach to generating awareness and 2014 will see continued innovation in the way it communicates with customers, partners and industry. The strategic partnerships developed with companies across CEE and Europe continue to play a key role in its global expansion and achievements. OMS’ expanding portfolio of retail clients and upcoming large-scale presence at EuroShop 2014 affirm its focus on retail sector success in 2014. Redefine how you look at retail with light as the cornerstone of a successful retail space. Join OMS for EuroShop 2014 at Stand G73 in Hall 11. Today announced its status as the only lighting manufacturer in Central and Eastern Europe capable of performing DALI compatibility testing on its products, in-house. DALI (Digital Addressable Lighting Interface) is the widely adopted industry standard for digital lighting solutions. OMS’ recent purchase of a DALI testing system from Lichtvision in Germany will not only guarantee all OMS products are DALI compliant but streamline product development, ultimately benefiting OMS customers. According to Dr. Martaus, the ability for OMS to test new products for DALI compliance on-site shortens the product development cycle and thus reduces time to market. The time and budget savings are passed along to OMS’ valued customers, contributing to an already significant competitive advantage. The emergence of LED solutions, demand for energy efficient lighting and the increasing use of lighting control systems all contribute to making the DALI standard, and its compliance, more important than ever. As an established innovator in the lighting industry, OMS has a vested interest in the continued advancement of digitally controllable luminaires and control devices. “Our membership in the DALI working group and ability to test on-site give OMS a voice in the standardisation processes and certification conditions for new DALI products,” said Manfred Raffler, COO, OMS. An active member of the DALI working group since 2012, OMS is one of approximately 90 international members with an aim to keep the DALI standard as current, uniform and reliable as possible. The majority of OMS products are designed for use with DALI installations, including the use of DALI LED drivers, control devices and auxiliary equipment, along with DALI Layout Consulting, Addressing, Set-up, Adjustment and Programming. OMS has risen to become the fastest growing lighting company in Europe. Its research and development centre comprises 120 experts that play an integral role in advancing the future of LED in Europe, pioneering the use of nanostructures, maxtrix optics and more. With multiple patents covering unique LED solutions, OMS’ groundbreaking projects range fromLQS, LQS Composer, the Right Light and global catalogues of lighting services, to name a few. In 2013 OMS established an in-house Energy Saving Division as an extension of our focus on providing customers with the highest level of service and the most effective lighting solutions. This new division, part of the Lighting Solutions Department, acts alongside the Lighting Trends Division and technical services to promote and implement the best quality and most sustainable light across all areas of application. The Energy Saving Division is responsible for the promotion of energy efficient and sustainable solutions and for increasing customer and cross-industry focus on the ecological aspects of lighting projects. To date, through the Energy Saving Division, OMS has instigated cooperation with the Green Building Council network, as well as becoming an endorser of the EU’s GreenLight Programme. We have also recently released LIACS, a tool that allows for the evaluation of a lighting system’s impact on air conditioning costs. We are also currently undergoing the process of updating all company materials to show in more detail the energy saving aspects of products. The Energy Saving Division has several key aims. Firstly to support customers with all efficiency aspects of lighting projects. Secondly, the exploration of cross-industry B2B cooperation in order to unite knowledge and strengthen our combined ability to move energy saving forward. Thirdly, the promotion of energy saving, efficiency and sustainability across all products and services with relation to EU initiatives. Fourthly, the development of educational materials and tools regarding energy saving. For more information contact Gabor Wein, Energy Saving Division Manager. Mobile: +421 918 482 355, email: gabor.wein@oms.sk. DOJČ, 21th January 2014 – Intelligent Lighting Management Systems – the right amount of light, at the right time and in the right place. Every space is specific and therefore requires a particular lighting solution tailored to its function and user needs. Moreover, appropriate lighting needs appropriate management. 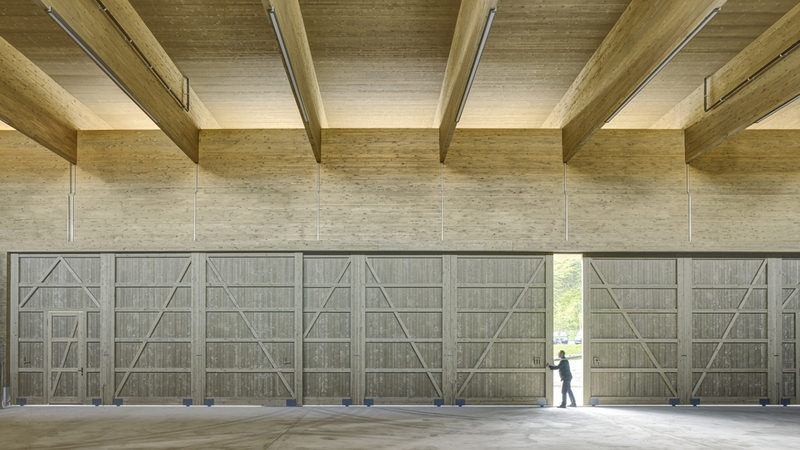 In response to this OMS offers not only the luminaires required by a lighting solution, but also the means of their control. The company has expanded its operation in the field of Lighting Management Systems, based on the extensive experience and technological knowledge in the design, project management and realisation of comprehensive lighting solutions. By incorporating lighting control into a system it changes it from simply being luminaires to being an intelligent solution, which ultimately makes life easier.Technology has developed towards the use of automation in all areas, lighting being no exception. Statistical analysis of developing lighting trends shows that up to 90 % of new and renovated lighting installations will be equipped with a Lighting Management System (LMS). Furthermore, new technologies and products are more and more focused on economical and ecological responsibility, both of which are greatly advanced by the use of an LMS. Taking control of your lighting you will afford you greater freedom, because lighting management means to dynamically change the light according to the needs of the user. An appropriately designed LMS allows us to benefit from energy savings as well as being more comfortable and independent. Within the framework of project development, OMS provides a comprehensive range of services covering lighting design, project management, realisation and after-sales. The service of designing and realising an LMS can be delivered as part of a comprehensive design project, or independently for those installations that require updating or do not currently have an LMS. And of course, besides standard lighting it is also possible to control RGB lightingfor both indoor and outdoor applications. Individual lighting management tools cover a wide range of functions, from simple manual control for small spaces such as individual offices or classrooms, to advanced control of comprehensive systems for large spaces such as manufacturing premises or sports ground. OMS uses LMS structures that are able to support more than 15,000 luminaires, including their control and monitoring, which can be implemented from anywhere on the planet. The choice of what kind of control elements will be used depends on the individual needs of each space and each customer. The LMS project covers the complete evaluation of the space, savings calculation, design of control elements and their programming, testing and the training of those who will use the system, ending with a final system audit to ensure its effective operation. A managed lighting system can be controlled using switches, touch panels, smart devices, computers… the combination of which ensures maximum user comfort and convenience. The design and realisation of an effective LMS means that you will always have the quality and quantity of light when and where you need it. The LIACS tool is a calculation software designed to show and quantify the impact of the lighting system upon the air condition system`s cooling load. Every light source and luminaire generates heat by radiation, conduction or convection and therefore has an adverse influence on Air Condition Systems. But, there is a significant difference between light source technologies - the older technologies dissipate more heat, the newer ones less. The use of energy efficient lighting reduces the cooling load of the space, further reducing energy consumption. OMS lighting´s experts in cooperation with students from Technical University of Romanian Cluj-Napoca at professional internship in OMS developed LIACS software as a tool for architects, lighting designers, engineers, facility service companies and developers. With the LIACS tool they can precisely calculate the effect of used lighting system and find the most efficient lighting solution from the AC system`s aspect, which leads to an increase of energy savings. A special microsite has been created to provide you direct access to the LIACS and to allow you to define the effect of a lighting system on a cooling load of a space and download the resulting charts. The 20th year of the conference was held on 23rd – 25th October at the hotel Permon at Podbanské in the High Tatras. DOJČ, 7th November 2013 – The 20th year of the conference was held on 23rd – 25th October at the hotel Permon at Podbanské in the High Tatras. The conference was aimed at the latest knowledge and innovations in the area of the lighting technique and offered the professionals as well as the professional public that took part in the event space for discussion and exchange of experience. The company OMS took part in the event not only as the main partner but it also actively participated in the conference programme. A team of experts from the R&D department contributed to the programme with a few thematic papers which aroused great interest among the visitors - LED Technologies – Today and Prospects (Smola, A. – Mácha, M. – Martaus, J. ); Artificial Skies and Model Measurements of Daily Illuminance (Darula, S. – SAV, Mácha, M. – OMS); Computer Simulation Possibilities of Luminance Distribution on Illuminated Hemisphere (Mácha, M. – OMS); Design of Asymmetric Reflectors for Linear Fluorescent Lamp T5 and Linear LED Lighting Source (Pazdera, M. – OMS); LQS Composer PRO (Jančuška, M. – OMS). Successful cooperation on the project of lighting for Champion sportswear boutiques in Italy continues. OMS in partnership with Grandi Talenti company designed and realized the project of lighting for another one, newly opened boutique in Bassano del Grappa. Realizations for new boutiques in other Italian cities are being prepared. LED luminaires used in the project are Downlight Caim, Downlight Prepus and Modul Avior Motion, which has been specially customized upon customer request. It comprises three Downlight Avior Motion units which are joined into one fixture with the possibility to adjust each unit´s direction of light distribution independently. We have updated our state-of-the-art showroom to include all the latest developments from OMS. Find displayed the latest LED technologies, including Cree TrueWhite. Uncover the possibilities provided by separately controlled blue LED ambient lighting, TunableWhite and RGB colour mixing. Discover truly futuristic technologies like invisible lighting and nanostructures. Then interact with it all using ultra-modern controls. Take a walk around and see how we will illuminate the future. The independent research department of the company OMS aimed at solving the area of light optics is recording the first results in the area of nanotechnology development. In partnership with a nanotechnology company from the foreign country develops and tests samples of exceptionally high precision optics typified by a faultless accuracy of detail expressed in tens of nanometres. This technology enables one to check and direct the luminous flux of the luminaire with a high degree of accuracy and to create effects which the current standard technology does not permit (img. Nanostructure Registry Machine). The optics on the basis of nanotechnologies is able to achieve an accurate directing of the luminous flux, its splitting up into numerous angles and a reduction or vice versa in its concentration. In this respect the optics based on nanotechnologies is able to replace the standard technologies to the full extent and it can also achieve such parameters that the standard technologies would not allow. This type of optics provides the designers of the company with entirely new opportunities for designing a new generation of luminaires. OMS presented the latest technology in lighting following newest trends, which is offered to the Montenegrin market. DOJC, 27th September 2013 - On the occasion of the new cooperation with Sindarela Commerce, OMS presented the latest technology in lighting following newest trends, which is offered to the Montenegrin market, at the hotel Podgorica on 19th September 2013. “The company Sindarela commerce which distributes about 25 world known brands in the territory of Montenegro has expanded its offer with the assortment of three brands of one of the leading European lighting companies, OMS. It is important to say that company OMS has 130 engineers, ready to comply with special requests of the buyers, making photometric calculations, 3D renderings, 98% of the production is being exported to 122 countries, including Scandinavian countries, Germany, Switzerland, France, and many others.” – said Mr. Zoran Vuksanovic, the owner and general manager of the company Sindarela Commerce. “The company Sindarela Commerce is our exclusive partner for Montenegro and I am convinced that we will achieve excellent results in the future.” – said Mr. Ludovit Kudela, OMS account manager for Balkan states. Anton Kozubik, OMS head of product management, presented all the three OMS product brands, as well as the production process of the company. He expressed the belief that OMS in cooperation with Sindarela Commerce will help to set new standards in lighting in Montenegro. The presentation was attended by many visitors, architects, electrical-engineers, investors and representatives of leading construction companies in Montenegro, as well as the mass-media. Together with its partner Swiss company Küttel exhibited on 10th to 13th September at the technology fair for building and infrastructure. DOJC, 20th September 2013 - OMS , together with its partner Swiss company Küttel exhibited on 10th to 13th September at the technology fair for building and infrastructure Ineltec 2013 in Basel, Switzerland. This successful event once again confirmed its position as an important communication and information platform, providing an overview of the latest innovations and trends. The exhibition and accompanying conferences and round tables were centered around the main theme of the event, intelligent networking of buildings. OMS presented the new luminaire Duelis and other products from the portfolio; Track Avior, Freyn, Prestige, Modul Box, Noviel and Castor. On 18th to 19th September the Shopping Center Forum 2013 (its autumn edition) takes place in Warsaw. DOJČ, 16th September 2013 – On 18th to 19th September the Shopping Center Forum 2013 (its autumn edition) takes place in Warsaw. It is a regular meeting of sellers and developers dealing with shopping centres and at the same time the biggest event of this type in Central Europe. OMS is one of the companies that present top-quality service and technologies for retail at this event. OMS will present itself in a presentation truck which will be placed directly in front of the entrance to the Warsaw centre EXPO XXI in a programme aimed at presenting projects of shopping centres, conferences, networking and displays of modern technologies and services. The programme and selection of luminaires in the mobile showroom is specially adapted to introducing modern solutions for illuminating the shopping spaces but also products demonstrating the latest technologies. The showroom visitors will be able to see luminaires which fulfil the criteria for effective lighting of the shopping and presentation spaces and support positively the atmosphere of the shopping space; Noviel, Prepus, Track Seeller, Air, Track Zipar, Prestige LED, Rebell, Track Cube, Avior Motion, Track Avior, Tubus Vision, Tubus Phact, Comet Motion, Downlight Quadro and others. Click here for more info about event. 2nd September 2013. The company OMS, spol. s r.o., a prominent producer of luminaires, supplier of lighting solutions and owner of an extensive know-how in the area of research and development in the lighting line of business introduced today an educational project – OMS University – during an opening ceremony and welcomed of its first year students. The OMS University is a unique project in the environment of the Slovak companies which offers the employee a chance to become a basic pillar in the company structure with a human potential. It has an ambition to bring up leaders for all management levels by the most modern methods. The OMS University is determined for the company employees as well as for external persons, who are interested in an innovative educational system through a complex programme with a credit system, one-time trainings and summer academies or specialised lectures with foremost personalities and experts. The educational programmes are oriented on practice; they include participation in concrete projects and realisation of practical management. The university students who passed the assessment centre before beginning of the study will use the most modern forms of study in the form of e-books, iPad, iPod, video lessons or e-learning. emphasised Vladimír Levársky in his address. The necessity to create a new educational model for the company needs resulted from the alteration of the firm into a global player performing in 122 countries worldwide which employs a lot of foreign specialists. “We are opening our door for people from other towns, regions and countries. For people who have different working experience, who speak other languages. And just this is one of the moments when we realised the necessity of the OMS University project. We are beginning to look inside our firm with a higher emphasis for us to give a chance to people who are already our colleagues but also to those who want to become our employees,” said Ľubomír Vačok, one of the OMS University founders. OMS Lighting in collaboration with Slovak design centre proudly presents the 2013 OMS Design Competition. We are looking for ideas and concepts from the designers community to create an entirely new vision for a luminaire of the future. The competition is divided in two categories. The category A „Innovative LED luminaire design“ is focusing on conceptual design proposals of a LED luminaire, without any limits for its application. Therefore you do not need to use existing luminaire design categories as base, but you can create a new luminaire concept or product. The category B is for „Conceptual control of luminaire by human interaction“. The competition is limited for professional designers and design students within the EU countries only. The competitors are required to submit an application to register for the competition, otherwise we do not accept submitted design proposal. The application is free of charge. The competitors register here. Jury will award designs and concepts which are original, creative and innovative in terms of their formal aspects. Application form must be submitted before deadline expires. Design proposals must be delivered before deadline for submission expires. A - Innovative LED luminaire design - conceptual design proposals of a LED luminaire, without any particular limitations to form, function, or performance. B - Conceptual control of luminaire - human interaction - human-machine interaction in a creative way, without any particular limitations to form, function or performance. Deadline for submitting applications and design proposals is extended to 2.9.2013! To register and find more information visit the Slovak design centre website. OMS uses Osram LEDs in its newest luminaire - STARTRACK from OMS’ ELITE portfolio. The right lighting in stores has a very significant impact on how shoppers perceive merchandise. When staged with proper lighting, exhibits in galleries and at trade fairs stand out from the competition. With Startrack from OMS, OSRAM Opto Semiconductors equips a luminaire for the retail sector using high-performance Golden Dragon Plus LED. These LEDs have impressive specifications and are of small size. In retail outlets as well as numerous other sectors, they enable merchandise and exhibits to be viewed in the right light. For the Startrack luminaire, OMS uses the Golden Dragon LED in various white tones. Thus the light colour can be selected easily depending on the type of product or exhibit. With its small dimensions, the Golden Dragon Plus can be easily incorporated in the luminaire and offers luminaire designers a great deal of flexibility and creative scope. Their long life of over 50,000 hours (depending on operating conditions) and superior efficiency ensure prolonged usage and therefore, reduced payback period. The Startrack has been designed to be incorporated in existing aluminium rails. The luminaire is suitable for virtually any store lighting application. It can be individually adjusted so the light direction can be flexibly modified. Eight Golden Dragon LEDs per luminaire (10W input) replace a 75W halogen lamp. 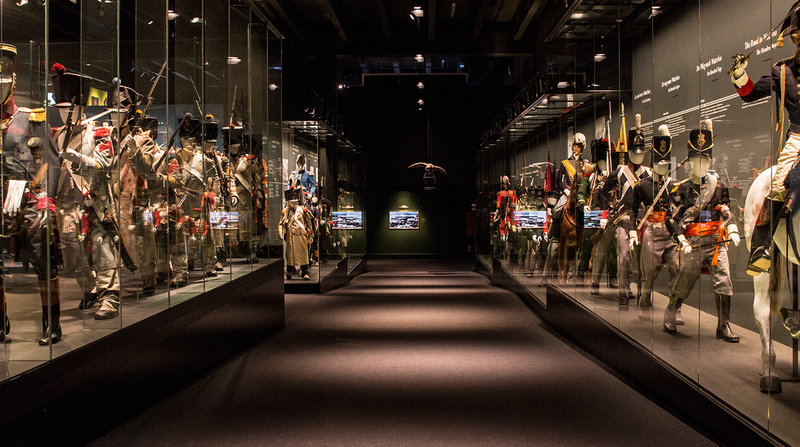 As LEDs do not emit heat generated by light, no harm can be done to sensitive products such as food or valuable exhibits. „For luminaire producers like OMS, LEDs are a technology we really want to shape. Today, we are certain that LEDs are fundamentally changing luminaire design and enable new applications such as integration in ceilings and furniture." OSRAM is a part of the Industry sector of Siemens and one of the two leading lighting manufacturers in the world. Its subsidiary, OSRAM Opto Semiconductors GmbH in Regensburg (Germany), offers to customers solutions based on semiconductor technology for lighting, sensor and visualization applications. OSRAM Opto Semiconductors has production sites in Regensburg (Germany) and Penang (Malaysia). Its headquarters for North America are in Sunnyvale (USA), and for Asia in Hong Kong. OSRAM Opto Semiconductors also have sales offices throughout the world. (For more information go to www.osram-os.com.) OSRAM, the parent company, offers to customers a complete supply chain in the LED sector including components, modules and solutions. 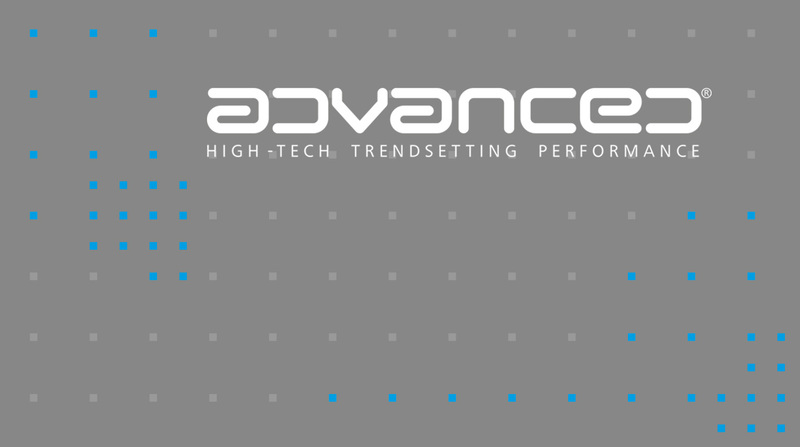 More than 50% of annual outlay on research and development is devoted to these technologies. OMS has been providing comprehensive services in the area of interior and exterior lighting design for almost 20 years. During the last three years, our product portfolio has included a product line named after the company itself: OMS. The time has come to rebrand this product line to better reflect its unique position in our portfolio. As such, we have renamed ‘OMS’ to ‘Advanced’. 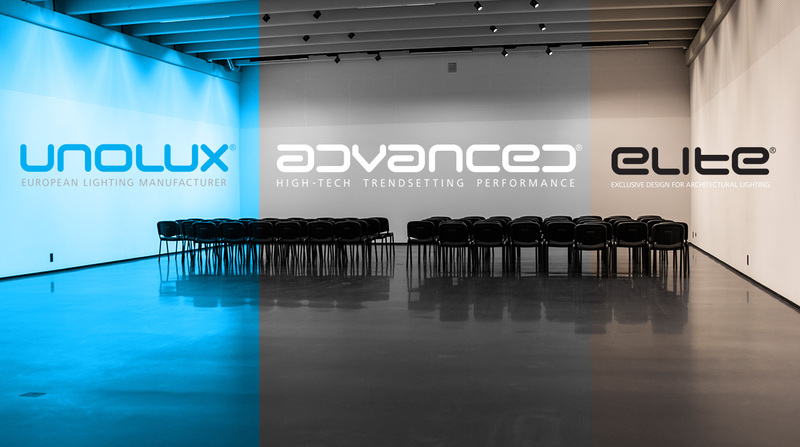 Therefore, our product lines are now: Elite, Advanced, Unolux. This new brand segmentation leverages support from OMS’ proprietary tools; LQS and the support of the LQS composer, LED Academy, and LMS (lighting management system), to ensure products are divided into different Right Light applications. OMS’ decades of lighting industry knowledge and industry-leading technical skill allow us to quickly adapt to customer needs and offer comprehensive support to address each phase of the illumination process. From project concept and lighting installation to service and adjustments, we work work with our clients to design the right solution for a given space and also help them select the right luminaires. Our company has a wide portfolio of lighting fixtures at its disposal and is able to customise lighting solutions according to a client’s specific requirements. Our many years of experience, strong technical background and emphasis on research and development enable us to provide our clients with complete support in their search for the most effective management system. Click the link which runs new plug-in installation with database of our products. Installing the program will facilitate your OMS product search. Every lighting fixture includes photometric files, pictures, and the photometric curve. Products are grouped by OMS product line (OMS, Elite, Unolux). The OMS and Unolux product lines are further segmented into indoor and outdoor applications. The plug-in is designed specifically for DIALux program users to enable a fast and easy search of our products by product line or category, as well as the direct import of photometric files into open projects. However, the plug-in can also be used without installation of the DIALux program. Once the plug-in is installed, an Internet connection is no longer required. The product database consists of more than 2,200 OMS lighting fixtures. 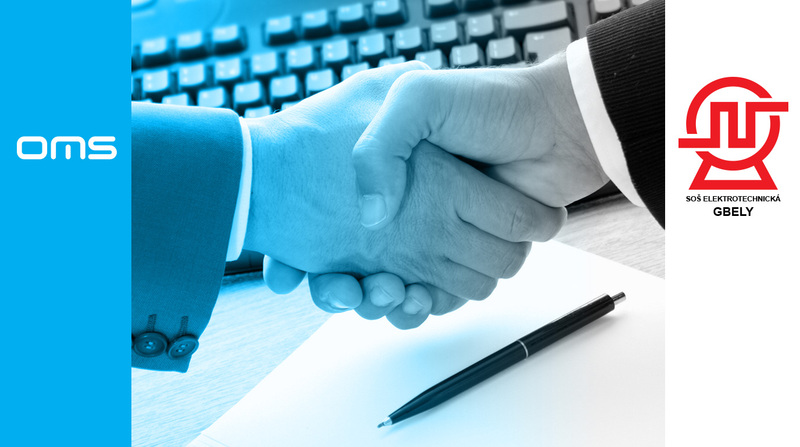 Partnerships between academic institutions and commercial companies deliver extraordinary results. The academic and commercial sectors were perceived as incompatible in Slovakia, until now. Today these two sectors have a much closer relationship than anyone could have imagined. The public/private sector partnership between Slovak University’s Institute of Electronics and Photonics at the Faculty of Electrical Engineering and Information Technology and OMS is proof positive that these partnerships produce extraordinary results. 1On July 10th, 2012, OMS opened a new showroom at its headquarters in Dojč, near Senica. OMS is an industry leader in lighting fixture production and as a supplier of complex lighting solutions to customers in 122 countries worldwide. As one of just a few companies in this industrial line of business, it has its own research and development department. In an effort to continually achieve better results and offer customers the most modern technological solutions, it proposed a collaboration with Slovak University’s Institute of Electronics and Photonics at the Faculty of Electrical Engineering and Information Technology. The offer received a positive response and last October, the partners created the basis for their collaboration – a successful project called LED Lab. The main goals of this cooperation were to: a) nurture bright academic minds with high technical levels of education to focus on designing the management and realisation of new LED lights b) develop high-quality products at reasonable prices with functionality that surpass the competition c) submit patents resulting from research and development d) develop organic LED and lighting fixtures. The LED Lab, the showcase of the collaboration between these industrial and academic partners, is building the foundation for educating the lighting industry’s future specialists and qualified experts. OMS understands the quality of the Lab has a direct impact on the calibre of these future industry leaders. Therefore, OMS has invested in building and purchasing devices for a specialised lab on the university premises aimed at applied research in the area of micro-electronics. The university students will have the opportunity here to learn everything about the technical aspects of lighting, from basic terms through to lighting fixture design and programming lighting systems. They will also deal with the development of electromechanical interfaces, electronic design and/or programming, from planning to implementation. The entire experience is designed to prepare students for the industry.OMS presented the first results of this collaboration at Light+Building 2012, the world’s largest trade fair for lighting and building services technology in Frankfurt am Main. It presented two highly technologically advanced products. The first product was Modul Razzor, a lighting fixture with a moveable light intensity distribution curve without any moveable parts. The second product displayed was the intelligent lighting management system, OMS Central Power Source (CPS). Enabling customers to substantially reduce energy costs, OMS CPS delivers a degree of lighting management system that previously required high installation costs. Among its most notable features, the CPS system can be implemented into existing wiring. A non-traditional combination of "aesthetics, design and modern technology." MODUL Razzor, with full LED backlighting, presents the latest generation of the LED light sources. OMS and Slovak University’s Institute of Electronics and Photonics at the Faculty of Electrical Engineering and Information Technology are currently working on five joint projects. One example is their collaboration on the development of the integrating sphere, a measuring device that is available on the market for approximately 80,000 EUR. The goal of the project is to manufacture a device of a higher quality for a substantially lower price (5,000 EUR) under the proviso of maintaining the quality and accuracy of the measurements. They are also working on optimising OMS’ goniophotometer device. The goal of the project is to develop a smaller scale version that would measure LED light sources and their characteristics with secondary optics of a refractor type (lens). They are also continuing development of an Elite version of the OMS Central Power Source (CPS) system, intended for the most demanding customers. The cooperation between the academic sector and OMS is a direct connection to the industry and also means a certain rate of dynamics in the framework of R&D. "The applied commerial research is, compared to basic research, substantially more dynamic, with a strong focus on achieving the final output," says Ing. Jozef Martaus, PhD., OMS, s. r.o. The partnership between OMS and the Slovak University of Technology is endorsed by the Slovak Research and Development Agency under the project scheme, “Centre of Collaboration for the Transfer of Innovative Technologies from Research to Industry”. The financial model consists of a financial contribution from the industry partner, OMS, and a matching financial contribution from the Slovak Research and Development Agency. To date, OMS has invested 115,000 EUR into its framework and will invest an additional 120,000 EUR by the end of this year. OMS and Giugiaro Architettura join forces. Both sides identify the partnership as a strategic one: one brings a "brand" design, the other, a new market. The largest manufacturer of lighting equipment in Central and Eastern Europe, OMS, will produce products designed by Giugiaro trademark. The Slovak company and the prestigious Italian design studio have agreed to a cooperation. OMS will introduce light fixtures developed with Giugiaro Architettura at LIGHT & BUILDING 2010, which takes place April 11-16 in Frankfurt, Germany. Though German Osram is one of the world’s leading lamp producers, the lighting solution for the cafeteria in its Regensburg headquarters was handed over to Slovak luminaire producer OMS. The fastest growing player in the global lighting industry did not let down its long-term business partner. The custom-made solution has not only reduced energy requirements by half but also provided full lighting control, with higher light output and better colour rendering index. “This is a logical continuation of a long-term cooperation,” says Ales Markytan from Osram Opto Semicondictors. The strong bond between the German lamp and component producer and the Slovak luminaire manufacturer was forged in the 90s. Osram has become a longtime lamp provider for OMS and the two cooperate closely in the research and development of lighting solutions. For these reasons, Osram chose OMS to provide the illumination solution for its employee cafeteria - where Osram staff replenish their stamina during the workday. The Osram cafeteria lighting solution used a special optical system called a microprismatic diffuser, which provides homogenous lighting without glare. Every luminaire is equipped with a dimmable LED driver that has full control through the DALI interface. Sufficient illumination together with a high colour rendering index provide a feeling and atmosphere of relaxation. “The active lighting management and more efficient light sources have decreased energy consumption in the space by half,” said Mr. Markytan. He has high praise for OMS’ work and confirms the Regensburg cooperation will not be their last. Both companies are already working together on the “Brilliant Mix” project, which aims to provide higher quality lighting and the possibility to tune the light colour. OMS has chosen a strong local partner Eon Electric to successfully enter the Indian lighting market. India and Asia are generally considered ‘foreign territory’ by most people from Central Europe yet the market potential is undeniable. In order to successfully compete with strong domestic producers, OMS has decided to join forces with a strong local partner and together they have established a joint-venture, Luxtra Lighting. „Our goal is to overcome competitors with our high quality product and unmatched lighting industry knowledge,” said Roman Krška, commercial director for OMS. “The plan is to fully realize India’s market potentia. The decision to enter the Indian market has also been fostered by the enormous technological advances the country is experiencing." One of the main goals in India is also to open a research and development division to leverage the talent of local universities. OMS does not enter a new market without first having knowledge of that market. For this reason, Luxtra Lighting was established with leading local electrical producer, Eon Electric. This new company will focus on the Asian markets. “The fact that we share common values such as transparency, flexibility and a commitment to innovation meant the negotiations went along quickly,” said Vladimír Levársky, founder and CEO of OMSEon Electric is one of the most important producers of high-tech electrical products for distribution, protection, control and conservation of electrical energy in India. With more than 50 years of tradition, it employs 3,000 people at the time. Luxtra Lighting is a joint venture of both OMS and Eon Electric focused on producing high quality light fixtures in India and other Asian countries. OMS’ Central Power Source (CPS) delivers an innovative solution to centralized power supplies for lighting fixtures. The CPS system features intelligent communication interfaces, modular rated power, plug and play operation, to name a few. Centralizing AC/DC converters from lighting fixtures to the central unit allows for luminaires that are smartly designed, more efficient, smaller, lighter, and cheaper (e.g. no need for driver-box). Since communication between luminaires and the central unit runs over DC power line, no additional wires are needed and therefore, it’s possible to integrate CPS into the existing installations. Optional DALI or 1-10V interfaces can be provided to ensure back-end compatibility with existing systems. If you don't have the 2012 catalogues and brochures, please use the links below to discover OMS’ exciting lighting trends and technologies. All new products are included with detailed specifications. Also, be sure to check out our newest book releases for 2012; the Corporate book and LQS book. The highly anticipated ELITE, ADVANCED and UNOLUX 2013 catalogues have arrived. The 2013 catalogues have been enhanced with OMS’ newest, most technically superior and effective luminaires and accessories. The lighting solutions presented fulfill the strictest aesthetical, technical and ecological requirements for a unique light design that is exclusive to OMS. In addition, OMS’ LQS and LED Academy have been thoroughly explained featuring an easy-to-understand graphical format courtesy of author Dr. Jozef Martaus. The catalogues are available in English, Slovak, German, French, Spanish, Italian and Russian. The UNOLUX 2013 catalogue is published as a universal version, featuring all seven languages. Now you have an opportunity to try OMS luminaires in an interactive virtual showroom. This virtual showroom displays advanced lighting technologies and modern luminaire design like those found in our actual showroom, which is located at OMS company headquarters in Dojč. Compared to standard virtual exhibitions, the OMS virtual showroom incorporates a level of functionality and interactivity that is second to none. Not only do visitors have an opportunity to see the luminaires in the showroom, but to control each of them. More than 70 luminaires from the Advanced and Elite product lines are divided into 11 groups based on the types installed in the modern showroom space. The virtual showroom is based on six main panoramic views, four of which represent various camera positions in the room while the other two illustrate the functions of the Modul Eye luminaire control and LED strip colour variations. Each view was recorded with the HDR technique featuring a dynamic exposure range. As such, to achieve the luminaire control functionality, more than 100 snapshots were required to create six panoramic images. The presentation works on virtually all screens with a common resolution; from the PC to lower-resolution tablets and smartphones with a minimum resolution of 800x480 pixels. It is compatible with the Android and iOS operating systems. Visitors can learn about each light through additional controls. For example, hovering over a luminaire with the mouse will display its name. Clicking the camera will zoom in on the light while revealing the panel with additional information on the luminaire. For those wanting more detailed data on the luminaire, clicking on the “datasheet” button will lead them to the luminaire’s product section on the website. The showroom also allows visitors to control the LED strips through the RGB mix functions, featuring nine colour options as well as adjustable colour combinations and colour programmes. Visitors also get helpful tips; visible on the bottom part of the screen, while navigating through the showroom. We invite you to experience our unique virtual showroom and explore our portfolio of luminaires, ‘hands-on’. The 7th Annual Light India; India’s largest lighting exhibition in terms of exhibitor and visitor numbers, was held October 5-8 at the Pragati Maidan exhibition centre in New Delhi. Luxtra Lighting, a joint venture between OMS and Eon Electric, successfully presented its product and technological innovations, including the Elite brand and LQS system. This year’s event showcased the newest products, technologies and trends from lighting industry producers across the globe and covered a gross area of 16,000 sq.m. Exhibition organizers Elcom (Electric Lamp & Component Manufacturers Association of India) and ISLE (Indian Society of Light Engineers) partnered for the first time with Messe Frankfurt, the world’s largest trade fair organizer who currently organises three of the most prestigious lighting industry shows in the world. Providing a large number of product categories, Light India 2012 offered a comprehensive and inspiring trade and marketing platform to visitors. Led by its President Mr. Sunil Bakhshi, the Luxtra Lighting team solidified the company’s position as a strong producer of high-end products. The uniqueness of the Elite range; a key brand for the Indian market, was demonstrated during the event. In addition, OMS’ presentation of its LQS system to the professional public formed an important part of the company´s exhibition at Light India 2012. Luxtra Lighting captured the attention and interest of trade fair participants, comprised of a wide range of lighting industry professionals including architects, designers, engineers, distributors as well as the general public. DOJČ, February 15, 2013 – On January 30th, The Faculty of Electrical Engineering and Information Technology at The Slovak University of Technology in Bratislava opened its workplace and labs to the general public. This event was designed to showcase the faculty’s workplaces, labs and technical equipment to those interested in studying at the faculty. OMS and The Institute of Electronics and Photonics of the Faculty of Electrical Engineering and Information Technology presented the LED Lab, a joint workplace focused on LED technology development. During the event, the LED Lab was shown to a large audience who had a unique opportunity to learn about the lab’s activities, directly from its employees. The lab supports research for modern lighting systems, training in the management of new LED systems, development of LED technologies and also presents research findings to both the professional lighting community and the general public. Established in 2011 as a company and university collaboration the LED DesignLab has since expanded with the addition of the SoftLab, a workplace that provides training on programming lighting systems. Lab employees as well as representatives from OMS and The Institute of Electronics and Photonics showcased the lab and its technical equipment. Visitors had an opportunity to learn about the development and manufacture of new luminaires, from electronic and thermal design through to the software development required for managing intelligent luminaires. Models of actual, current projects resulting from this private/public sector collaboration were introduced. The presentation of digital lighting management through mobile devices (we are just preparing its launch to the market) was met with a very positive response. During the two-year collaboration between OMS and the university, many innovative products and concepts have been developed and showcased internationally, confirming the importance and effectiveness of public-private partnerships. The collaboration between OMS and the Slovak University of Technology on the project framework, “Centre of Collaboration for Transfer of Innovative Technologies from Research to Practice” is realised with support of the Slovak Research and Development Agency’s programme “Support for the Cooperation of Universities and the Slovak Academy of Sciences with Entrepreneurship”(CUSASE). The highest quality research and development is critical for innovative companies like OMS. To ensure an environment of continued innovation, OMS has initiated a close cooperation with Slovak University’s Department of Microelectronics at the Faculty of Electrical Engineering and Information Technology. This follows OMS’ successful cooperation with Slovak University’s Department of industrial Design and Department of Lighting Technology on the launch of the LED Academy. The 50th anniversary of the Department of Microelectronics foundation also marked the opening of the LED Lab; the culmination of a six month study, “Academic Field and Industry Connection”. Presentation of OMS’ social responsibility for development and education in both the LED Lab and in the Slovak University of Technology. OMS provided complete lab reconstruction and invested in the purchase of required devices. Our Elite products Indirect Vega LED (versions: Basic, Blue Decorative, RGB Decorative) and Modul Ray Tunable White contribute to the lab’s lighting. The entire lighting system is adapted for teaching the wide range of settings offered by DALI management. The lab’s entrance area is illuminated with our latest LED Spots (Track Lotus, Track Avior Advanced, Track Cube and Track Air), which throw light on illustrated posters that explain a lumaire’s composition. Lab visitors can learn about basic lighting terms (luminous flux, white colour light temperature, CRI, etc.) through to the construction/function/structure of luminaires and the practical use of our newest lighting systems (mode of lighting scene, setting of required light temperature, etc.). Illimitable colour composition, smooth colour transition, light and shadow effects. All these are important architectural elements of the future. Innovative and high-quality luminaires create luxurious lighting effects and present new dimension in architectural lighting. 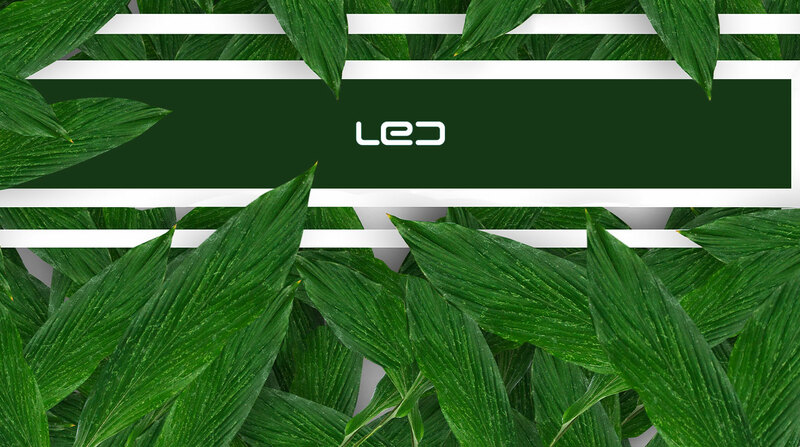 The latest LED technology complies with users’ and investors’ creative, technical, and practical requests. LED products provide high lumen output and long lifetime. Architainment luminaires are suitable to be used from small areas to large spaces to create professional atmosphere for entertainment and leisure. Lighting solutions are sustainable for various indoor/outdoor applications, such as lighting of shop windows, commercial and cultural sociable centers, open spaces, as well as clubs and restaurants. Our close cooperation with leading suppliers of components provides reliability with a technical and practical conditions of designers and project architects. Building. Park. Residence… Let’s light them up and find the magic in. New brochure Architainment is here for downloading. OMS’ unique lighting roadshow, European Lighting Tour (ELT), begins its Spring tour across Europe. OMS’ specially furnished truck, equipped with modern lighting technology and luminaires, will hit the road from March 11th to June 21st. Its first stop will be in Warsaw, Poland for the international lighting exhibition, LIGHT 2013. It will then continue its journey through Poland to the Czech Republic, Austria, France, Belgium, Sweden, Finland and Norway. The ELT’s inaugural year proved to be a very successful way to present the company and its philosophy. During a period of six months in 2012, this mobile “lighting academy“ drove more than 25 thousand kilometres. It made 32 stops at trade shows, lighting exhibitions and partner-organised events in 13 European countries. More than 1,600 invited guests and visitors participated in over 100 presentations. The programme presented the latest lighting trends and OMS’ lighting philosophy featuring its Lighting Quality Standard (LQS) and the LQS Composer tool for lighting designers. Last year’s ELT was divided into Autumn and Spring tours where we succeeded in supporting brand awareness among current and prospective customers while bringing our lighting creation concept closer to them. OMS has prepared a broad portfolio of communication materials to complement the ELT Spring 2013 tour. From corporate videos to images of OMS’ production technologies and presentations focused on OMS’ unique concepts (LQS, Right Light and LMS), the focus is on educating current and prospective customers on the company and the lighting industry. Demonstrations of new luminaires, presentations of product innovations through 3D projection, TouchPads as well as a virtual visit of a luminaire showroom will form the interactive component of the tour's programme. Company representatives will walk visitors through the programme and provide them with an expert introduction to the world of lighting. Architects, lighting planners and designers have been invited from each stop on the tour so they can learn; on the spot, about the technologies OMS is using in the area of lighting design. Vladimír Levársky, the founder and General Director of the company OMS, won the national round of the competition Entrepreneur Of The Year 2013 this March. A few days ago he represented the Slovak business at the final of this competition in Monaco. Approximately 40 business stories fought in the Slovak round of the competition; however, the decision about the winner came surprisingly fast and was unambiguous, as the jury said. “This award means a life satisfaction for me. It is an inexpressible feeling, a very strong emotion and a new drive for further progress of the whole firm,” said Vladimír Levársky after winning the title Entrepreneur Of The Year 2012 in Slovakia. The objective of this competition is to introduce important business personalities who bring positive changes to the entrepreneurial environment of the country to the general public and in this way to support further progress of entrepreneurship. The competition Entrepreneur Of TheYear has been organised since 1968, when the company Ernst & Young announced it in the USA for the first time. All national winners of the current year were competing for the title in Monaco. 49 winners of the national rounds from 47 countries worldwide were nominated for the world final which took place from 5th to 9th June at the hotel Hermitage in Monte Carlo. “Mr Vladimir Levársky, the founder and General Director of the company OMS excellently represented the Slovak Republic at the World Final Entrepreneur Of TheYear 2013. He attracted the jury especially by his innovative approach to doing business as well as the international activities of his firm in more than 120 countries worldwide. Mr Vladimír Levársky is a perfect example of an entrepreneur – visionary whose story is an inspiration for thousands of people,” said Stand Jakubek the partner-in-chief of Ernst & Young in Slovakia. OMS Lighting represented by its founder was standing alongside the most significant innovative firms and personalities in their background, e.g. Infosys, Fila, Italian Brempo or Austrian Guger Technologies. The international jury, created by the winners and finalists of the previous years, decided directly at the venue and its decision was announced during the ceremonial gala evening on Saturday (8th June). All title-holders from individual countries were introduced during the gala evening. Vladimír Levársky was introduced to the Hall of Fame of the Entrepreneur Of The Year competition together with other finalists. At the stage he encountered face-to-face the chairman of the Ernst & Young Board of Directors Mark Weinberger. “We Slovaks can hardly compete by our turnover in a world-wide competition, but in spite of that we are innovative, we can offer a lot and for me the stories of the businessmen were very inspiring, “ Vladimír Levársky who took part in the ceremonial week of assessments and declaration of results together with his son, a promising successor of his entrepreneurial path, evaluated the situation in this way. The suspended, surface mounted or recessed LED luminaire with a luminous flux of 17200 lm is characterized by an unconventional design and exceptionally efficient optics. An optimized heat dissipation solution, based on convection, enables the luminaire to achieve its low weight. Grafias reaches an extremely long lifetime of up to 100 thousand hours thanks to the LED light source used. Its high degree of IP protection, IP 65, ensures its reliable operation even in areas that are demanding on the luminaire’s resistance such as storehouses, industrial areas and petrol stations. According to the product’s design team, Grafias is the result of an extremely creative and productive cooperation and introduces many unconventional solutions that make the luminaire stand out among competing products. The luminaire’s unique design and parameters are the result of a close collaboration between the product design team and specialists from the company’s optic design, electronic design and thermal design departments. The result is a luminaire which, based on its luminous efficacy values and the total added value alone, considerably exceeds all competing products on the European market, while featuring an attractive design. On October 8, 2010 OMS achieved another milestone toward its global presence. OMS has opened its latest store and showroom in Khartoum, the capital of Sudan, the largest country in Africa. And what a memorable day it was. Mr. Mohamed Afifi, the local representative for OMS, had been preparing the event for months. Mr. Afifi made sure that the country’s biggest investors and investment representatives would be aware of the new possibilities. On the big day, he was supported by Ing. Martin Chyla, commerical director for OMS; Mrs. Helena Mravíková, the head of the commercial section at the Embassy of Slovak Republic in Egypt and Dr. Nasr Eddeen Sholgamy, the honorary consulate of Slovakia in Sudan. They also brought positive news from Slovakia: The country decided to write-off the State debts of Sudan, valued at 40 million euros. Slovakia became the first European country to make this decision. "There are many connections between Slovakia and Sudan. During my short visit I have met many people who have previously studied in our country or who are aware of the quality of products made in Slovakia." "There are many connections between Slovakia and Sudan. During my short visit I have met many people who have previously studied in our country or who are aware of the quality of products made in Slovakia. The African continent offers an enourmous potential in lighting. A number of great investments have been announced in Sudan and neighbouring countries, and OMS wants to be as close to its local clients as possible. Our latest portfolio of high quality, eco products will offer a strong alternative to cheap but unsustainable imports. We look forward to discussing the opportunities with local investors," said Mr. Martin Chyla during his opening speech.